Caption slip reads: "Photographer: Wyman. Date: 1957-11-26. Reporter: Farrell. Assignment: Nisei Scouts. Special Instructions: Future. 11/12: Chow line readied at camp site set up in MacArthur Park training exercise. From left front of picture, Richard Quan, with plate, John Inouye (cook), Philip Ozeki (holding sign), George Koide (flag), and Kiyoshi Fukuda. 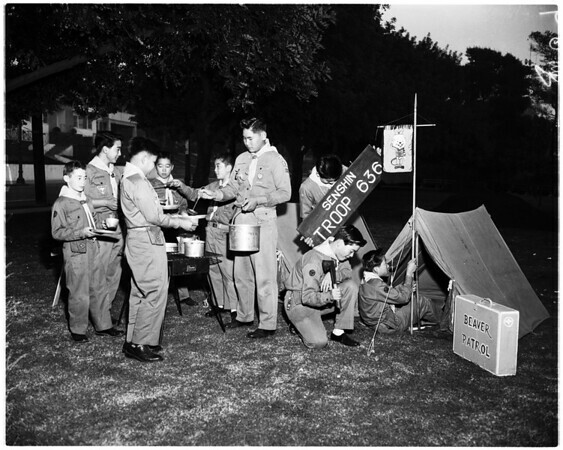 69/70: Nisei Scouts of Troop 636 run for chow in MacArthur Park Camp training exercise. Cooks and crew are from left to right, Jon (cq) Takemoto, John Inouye, Philip Ozeki, Kiyoshi Fukuda and George Koide".